Kombucha. Ummm…exsqueeze me, whatcha drinkin? You are here: Home / Foodie Friday / Kombucha. Ummm…exsqueeze me, whatcha drinkin? Nah…the kombucha love has begun to spread out reaching folks I didn’t even think would give it a second glance (here’s looking at you TiKi). I know some are still interested, intrigued, bumfuzzled to its benefits and possibly want in on the action. So, here are the top 3 reasons I love this magical elixir. Digestive benefits and increased immune function – The natural occurring probiotics help to increase your gut flora (think more good guys than bad guys in your gut) which benefits the processes that happen inside. The good guys will fight the bad guys and win more! 🙂 Good bacteria will help detoxify your liver allowing digestion to happen easier as well. Energy boost – It’s my 2 o’clock drink. If I start feeling my world get saggy, then I know it’s time to bust out the kombucha and things will start to perk up again. Kombucha is rich in B vitamins especially B-12 which gives you a nice, natural energy boost. Plus, the detoxifying benefits allow your body to function with less strain on your system therefore giving you energy. Rich in vitamins, enzymes and minerals – It’s like drinking your daily vitamin. The sugar that you feed will be remade into organic acids that keep your blood sugar low therefore making it low glycemic and anti-inflammatory. I do want to provide some further reading, just to have full disclosure. 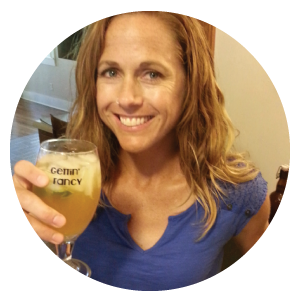 Here are a couple of articles that were written about kombucha. You decide for yourself. And let me know if you want in on the goodness. And now….for you, I have prepared a song. Think Gloria Estefan, Conga and let the rhythm get ya. Juice the lime into a glass. Add the grated ginger and mint leaves. Muddle together (so fancy right?). Add ice to the glass and then pour the kombucha in. Enjoy! !